As many of you know, we are great fans of Masterchef Australia. As we’ve been watching the show we loved all the restaurants we saw and learned about. Many of the chefs greatly inspire us to go into our own kitchen and try new things. When we were planning our vacation to Australia we now had the added perk of knowing of some fantastic places to dine. Matt Moran has been one of the most inspirational chefs and we couldn’t pass up the opportunity to dine at Aria in Sydney. We inquired when we were making our reservations if Matt would be there so we could chat with him but unfortunately he was busy doing the Good Food and Wine Show in Brisbane. This ended up being a plus for us because we got tickets for the show and had a brief chat with Matt, bought one of his cookbooks and got to see him on stage. We decided to have the pre-theater dinner at Aria the night before we left Sydney for other Australian adventures. It’s good we waited to the last evening because I would probably have wanted to have dinner there repeatedly and missed out on other places. There were so many yummy sounding dishes on the menu. We ordered from the pre-theater menu and specials for the evening. Ken loves salmon and couldn’t pass up the special Salmon entree. It was a New Zealand salmon cured with kombu and earl grey tea, yuzu tapioca and avocado puree. The flavors of this dish were just perfect for him. Yuzu is a traditional Japanese citrus, used almost exclusively for its aromatic rind. Yuzu has an aroma that’s distinct from lemons, limes, or any other Western citrus fruit. The yuzu tapioca was a great flavor and texture with the cured salmon. I narrowed down my entree and main course selection to two dishes in each one. I was torn about which ones I wanted to try. Everything on the menu just made my mouth water. I decided to pick between the Kurobuta pork belly with pork croquette and caramelised apple or the Peking duck consommé with duck dumplings, shaved abalone and mushrooms. When our server came to the table I gave him my two choices from the entree and main and asked for his help in pairing and deciding what to order. I told him this was my one chance to eat at Aria because we were on vacation. He advised that I shouldn’t pass up the chance to have the pork belly. He was right, the pork belly was so good. 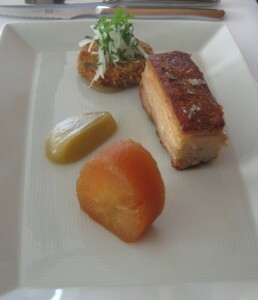 The crispy pork with the flavors of the caramelised apple were fantastic. I attempted to get a little bit of each flavor on my fork so I would have a perfect mouthful. Each of the flavors were delicious on their own and had great flavor and texture when combined in one bite. The sweet smooth apple with the salty, crispy pork was wonderful. Kurobuta Pork is the most highly prized pork in Japan and comes from the ancient breed of pig known as Black Berkshire. The meat from the pure oriental strains of Black Berkshire, found in Japan, is regarded as the highest quality pork in the world. In Australia Kurobuta Pork is being farmed and bred with the strictest guidelines and testing for purity. Ken narrowed down his two main course options to be the crisp skinned barramundi fillet with zucchini, lemon and pine nuts or the roasted fillet of King salmon with fennel, orange and watercress. Also, he does not eat meat and the vegetarian option of quinoa crusted celeriac with grilled baby leeks, fried camembert, fregola and salsa verde was very tempting for him to try. Since he had the salmon entree he decided to go with the barramundi. 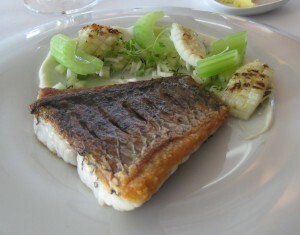 The crispy skin was perfect and the barramundi fillet was perfectly cooked and full of flavor. Since Ken’s barramundi course didn’t really come with a vegetable that would be enough to satisfy his appetite we ordered the truffled potato mash as a side dish. I’ve never had anything with truffle in it before and I loved this flavor. 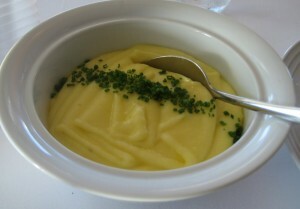 The potatoes were very smooth and creamy. I’d have to describe them as having the texture of silk. When ordering side dishes from the menu keep in mind that they are a fairly good sized portion to share with the table. Now it was time for my main course. My two selections were the roasted lamb rump with ricotta gnocchi, pumpkin and mustard fruit purée and a sage and balsamic sauce or grass fed scotch fillet with lyonnaise potatoes, green asparagus with a bone marrow and cornichon sauce. I like beef, probably more than lamb, but I rarely eat either one. The scotch fillet sounded wonderful but our server advised that with the Kurobuta pork entree the scotch fillet might be too rich. 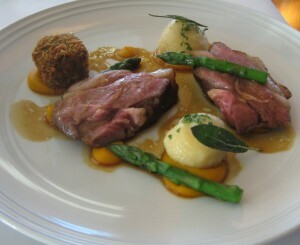 So I selected the roasted lamb rump. This cut of lamb is a little on the fatty side so if you want lean meat it’s not for you. I cut most of my fat away. Regardless, it was a delicious dish. The ricotta gnocchi were my favorite thing on the plate. I could have eaten a whole plate of them. The outside of these gnocchi were firm and the inside were gooey and creamy. The flavor was perfect. I enjoyed the entire dish and had some of the truffled mashed potatoes too. Since purchasing Matt’s cookbook and seeing how he makes gnocchi I’m looking forward to trying his recipe so I can see if I can get mine to come out as well. For dessert I ordered the Strawberries and Cream. 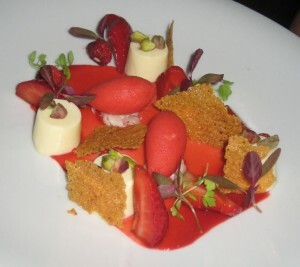 This was a panna cotta with pistachios, balsamic strawberries and strawberry sorbet. The strawberry sorbet was packed with flavor and so smooth and sweet. This was a light dessert and perfect for finishing off a fantastic meal. 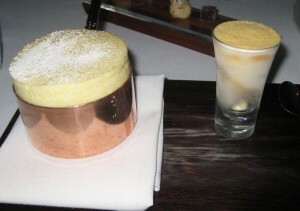 Ken ordered the dessert special a Passion Fruit Souffle with lemon posset. He loves passion fruit and selects any dessert with it in when he has the chance. It was heavenly and a perfect finish to a wonderful dinner. 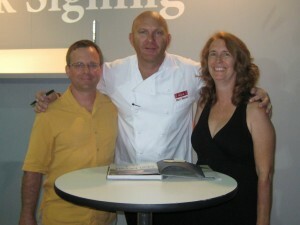 I wish we would have had more opportunity to chat with Matt Moran and I’d love to go work in his kitchens just to learn some of the great dishes and cooking techniques he uses. Thank you Matt for being such an inspiration in both our lives. While Aria can be a more expensive option for dinner everything was so perfect from the food to the service and the atmosphere. It’s a place we would put on our list of places to go for any special occasion. It’s a shame it’s such a long trip to Sydney from home. NOTE: If you’re part of this establishment and I’ve made an error in describing something please let me know by email or comment on this article. I am frequently so involved in the flavors of the food that I remember something incorrectly when writing about it.